Chairman and chief executive Stephen Marks established FCCN more than 40 years ago and has generally run the show ever since. He retains a 42% shareholding, has not sold a share since 2004 and in theory looks to have the industry experience, company loyalty and financial incentive to ensure FCCN ultimately recovers. Various newspaper interviews (and my experience at the AGM) tell me he runs FCCN on his terms only — and his terms have not been successful for some time now. In fact, between 2009 and 2015, the business has racked up aggregate losses of £57m while the dividend has gone missing for the last three years now. Mr Marks turns 70 next year and I am not clear whether a pensioner can ever have his finger on the pulse of the fashion industry. I reckon it’s time he stepped down to become a non-executive and hired a fresh chief exec to plug the losses. After relinquishing the role of chief exec in 1989, Mr Marks took back the position in late 1991. 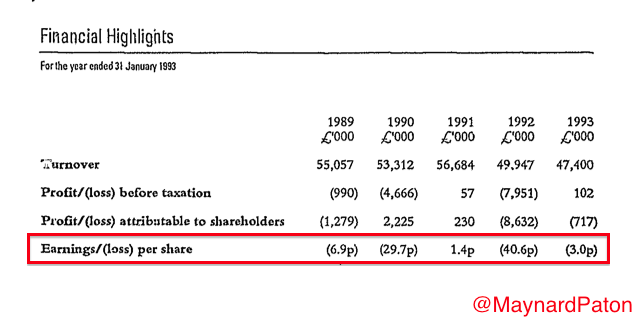 Profits between 1994 and 2004 then zoomed from £5m to £38m. FCCN’s current difficulties started in 2005, accelerated in 2007 and have been festering ever since. A decade or so of mostly annual losses or minimal profits suggests some deep-rooted problems — and various strategic reviews have all failed to bear fruit. Sustaining FCCN’s losses of late has been the firm’s net cash position. At the last year-end, cash was £23m and debt was zero. So for the time being at least, FCCN has the resources to fund a recovery and should not have to call on Mr Marks for another interest-free loan. FCCN’s finance director has decided to leave after only two years in the job. 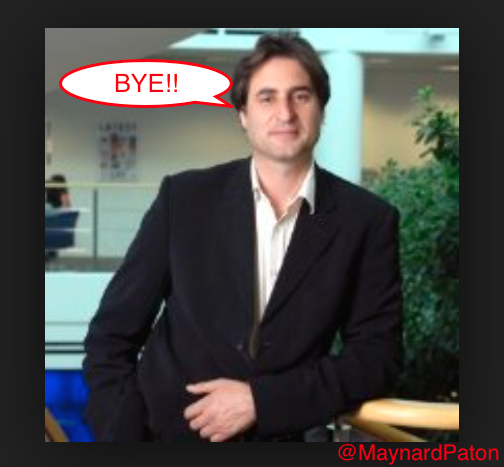 So a top-notch replacement might be just what FCCN needs to help persuade Mr Marks to take radical action and quickly cull the losses. The outgoing FD may have become fed-up with Mr Marks, the group’s recurring losses, general financial fire-fighting and reading forthright letters from annoyed shareholders — job features that may not attract a tip-top successor. A 33p share price equates to a £32m market cap and looks astonishing value when FCCN’s Wholesaling and Licensing activities — less central costs — produced operating profits of £10m last year. The fashion industry can produce sudden and wonderful money-spinners — if you get the product spot on. During its heyday, FCCN’s infamous FCUK brand helped annual profits reach £38m — a figure that surpasses today’s market cap! Another popular range could quickly revitalise profits. The infamous FCUK logo was hit upon by veteran advertising guru Trevor Beattie, who apparently got the idea from simply noticing the acronym on a company fax. 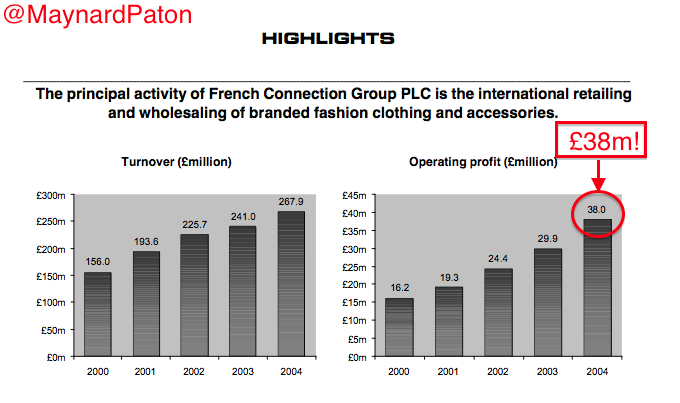 A decade after FCUK peaked, FCCN has yet to establish a worthy follow-up and the gross margins now earned by the brand (at 57%) simply aren’t high enough to cover the group’s store costs. A major cost problem for FCCN has been its shop leaseholds — rents have been too high given those diminishing gross margins. But at least the group’s future liabilities have been diminishing, too. Last year’s rent bill came to £24m, so the average lease has six years to run (i.e. £145m/£24m). In fact, FCCN claims the average lease at its under-performing UK/Europe stores has just four years left to run. Nine outlets were closed last year and a further seven are planned to go this year. At the last count, FCCN operated 75 stores throughout the UK and Europe. Some of FCCN’s stores have leases that run a lot longer than the next four years. For example, the group’s flagship outlet on Oxford Street, London, operates on a lease agreement until 2025 — and currently costs “more than £3.2m a year”. Plus, FCCN’s HQ building was sold earlier this year and the buyer is apparently “banking on office rents almost trebling” to justify paying 35% over the asking price. FCCN is currently spending £1m a year for its HQ lease — and a rent review is imminent. The aforementioned Wholesaling and Licensing divisions managed to earn operating profits of £21m last year and, after central costs, could deliver £10m for the entire group. Both divisions haven’t experienced fantastic growth recently. Wholesaling profits have edged up by just £0.7m to £14.6m during the last two years, while Licensing profits at £6.5m are lower that that recorded three years ago. 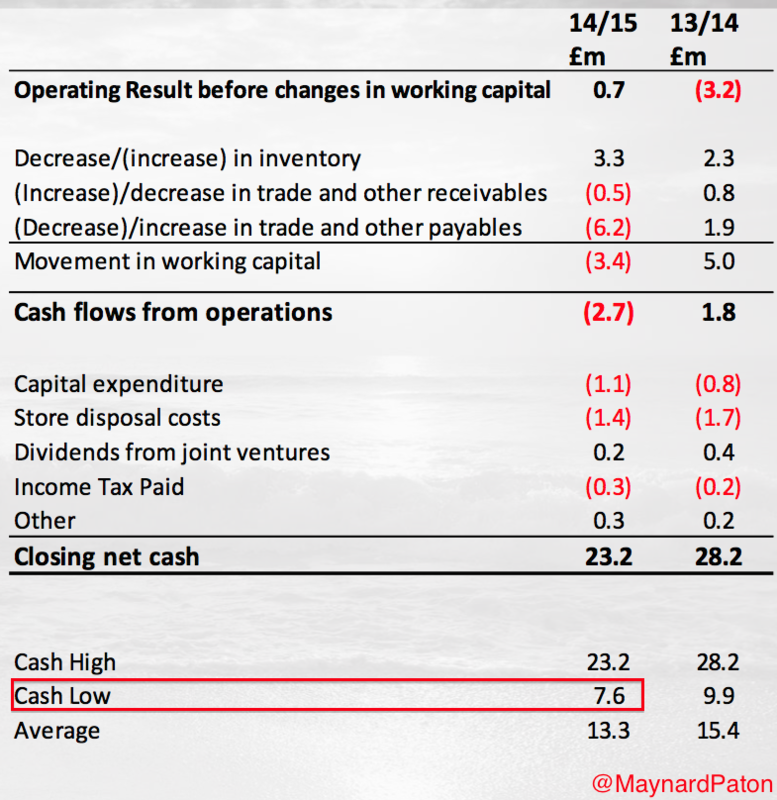 The turnaround theory is very simple: the next few years should see more stores close, retail losses reduced and the group return to profitability as the Wholesaling and Licensing divisions maintain their current income. By then, profits could make the present £32m market cap look a genuine bargain. I first bought FCCN shares during July 2011 and fours years on I am still awaiting a permanent recovery. I suppose there’s every chance the next few years witness additional mishaps, those group losses extend even further and Mr Marks remaining defiant in the face of even greater shareholder despair. 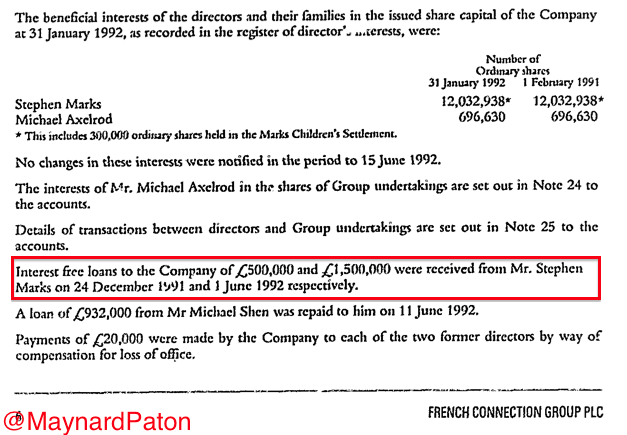 Disclosure: Maynard owns shares in French Connection. FCCN have been on my watchlist for a while, but I’ve never bought any shares in the company I was looking for tangible signs of improvement in the performance of the business. In my view the investment thesis is largely predicated on the company, being able to exit the loss making retail part of the business as you say, and focus on the Wholesale and Licensing elements. I just wanted to get your thoughts on the opportunity cost of not investing your money in a stock that is performing now. So for example I invested in Topps Tiles, and sold out earlier in the year (far too early), as the stock has performed well since I exited, as well as taking a small position in Supergroup which has done very well since the turn of the year. As a relatively new investor this is something I’ve been trying to get my head around . Would welcome your thoughts. Thanks for the note. Well done on avoiding FCCN to date. I would like to think if there are any signs on tangible improvement, the share price will quickly become a lot higher than it is now. I think with ‘lost opportunities’, you have to look back at why you bought initially and why you sold — and work out whether you are consistently selling ‘too early’ and why. In a bull run, everyone will sell ‘too early’, but if your approach and evaluation of the fundamentals continually short-changes you, then you may have to think about adapting your investing philosophy. Personally I have sold many shares too early — Clarkson at under £2 being a classic back in the early 00s. I regret those, but funnily enough the same approach led me to sell out of some howlers before big trouble emerged (such as SeaEnergy earlier this year). I think overall what counts is whether your approach works for you on a consistent basis over a good number of years. There will always be ‘what if I held’ situations — you just have to accept them when selling. Or you could always retain a few shares of every company you buy, just in case! Looks like he’s added 1m shares to a Gatemore fund, and put his 4.8m shares under the administration of his firm. I suspect the purchase was what caused the price spike earlier this week. 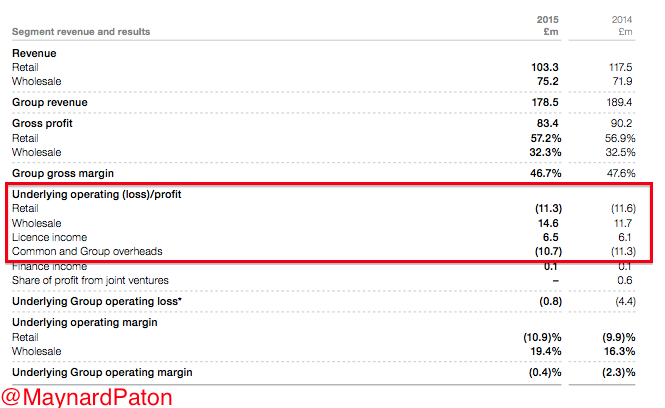 He first disclosed his 3% shareholding in Nov 2013 and at least he is still buying more. Good man.